US negotiators were in Beijing yesterday for a new round of high-stakes trade talks, hoping to reach a deal before the March 1 deadline set by Donald Trump as the IMF warned of a possible global economic “storm”. Preliminary discussions had been expected to start on Monday, according to the White House, before US Trade Representative Robert Lighthizer and Treasury Secretary Steven Mnuchin step in for the main event on Thursday and Friday. In December, Washington suspended for three months its plan to increase tariffs on $200 billion worth of Chinese imports -- to 25 per cent from the current 10pc -- to allow time for negotiators to work out a trade spat that has triggered fears of a global economic slowdown. Deputy trade representative Jeffrey Gerrish was due to lead the US delegation in preparatory meetings to begin on Monday, the White House had said. The talks will include officials from the agriculture, energy and commerce departments. 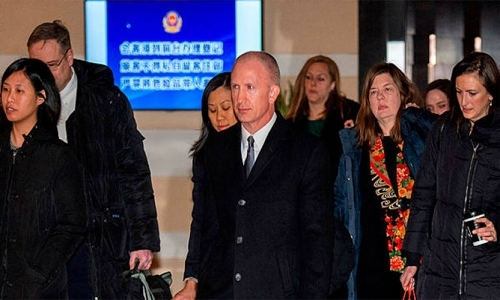 Gerrish left his hotel in central Beijing on Monday morning without talking to the media. Neither side offered any confirmation that talks actually started. Mnuchin and Lighthizer will be joined by David Malpass, Trump’s nominee for president of the World Bank who has worked to limit the bank’s assistance to Beijing. The Chinese delegation will be led by Vice Premier Liu He, who will be joined by central bank governor Yi Gang. Liu, China’s chief trade negotiator, met last month with Trump, who announced that a final resolution of the trade dispute would depend on a meeting with Chinese President Xi Jinping “in the near future” to iron out the “more difficult points” fuelling the spat. While the two sides said major progress was made after talks last month in Washington, more recent comments have jarred financial markets, amplifying concerns about how the dispute will affect global growth. Trump said last week that he did not expect to meet his Chinese counterpart before the trade truce expires on March 1, and top White House economic adviser Larry Kudlow said that while Trump was “optimistic” about a deal, a “sizable distance” still separated the two sides. Washington is demanding far-reaching changes from China to address commercial practices that it says are deeply unfair, including theft of American intellectual property and myriad barriers that US and other foreign companies face in the Chinese domestic market. China has offered to boost its purchases of US goods during the truce, but is likely to resist calls for structural changes to its industrial policy including slashing government subsidies, said Louis Kuijs of Oxford Economics. “The US side will not fully remove the spectre of tariff hikes any time soon,” Kuijs said, given that there is “broad support in the US for a hard stance on China”. The two sides have already slapped tariffs on more than $360 billion in two-way trade, which has weighed on the two countries’ manufacturing sectors and sent jitters through global markets.